When it comes to curing back pain, there is no time for trial and error.What you need is immediate and lasting relief. Osteopathy will not only cure your back pain, but will give you the tools you need to stay healthy. When unbearable pain hits you in the neck or back, visit us at mhealth – we have experienced osteopaths who can evaluate, diagnose and treat your pain or injury. Our osteopaths holistically identify and resolve dysfunction root causes. When necessary, we refer patients to other services for active rehabilitation to prevent further injury. Osteopathy is a well-established system of manual healthcare that recognizes the important link between the structure of the body and the way it functions. It is a hands-on therapy, which involves skilled evaluation, diagnosis and a wide range of techniques to alleviate problems affecting the entire musculoskeletal system. Osteopathy aims to assist the body in activating its own self-healing mechanism by reducing pain and improving function allowing the body to effectively return to optimal health. Osteopaths complete a 5-year double degree at university. At your initial visit, your Osteo will take a case history to find out about your problem, record any previous medical history and general health. We then carry out an examination using standard medical tests along with skilled palpation to identify the dysfunction causing your pain. Osteos take a holistic approach to treatment, which means your practitioner may look at other parts of your body, as well as the area that is troubling you. For example, if you have a sore knee, your osteopath may also look at your ankle, pelvis and back. At mhealth, our holistic approach allows us to pin point the causative issues surrounding the dysfunction and resolve them as soon as possible, subsequently aiming to reduce the number of visits and little need for ‘maintenance’ treatment where possible. If you need onward referral to other services, such as Clinical Pilates or Clinical Yoga, your Osteo will ensure you understand the need for active rehabilitation and the importance of it to prevent further injury. Osteopathy is covered by most Private Health Funds and is registered for DVA, WorkSafe and TAC Claims. 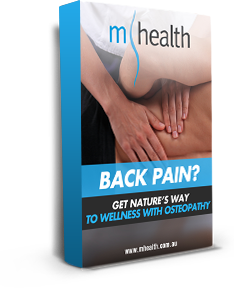 If you would like further information on mhealth Melbourne Osteopathy book an appointment now, (03) 8585-2222 or send us a message. Our professional osteopaths have years of experience in evaluating, diagnosing and treating body pains and injuries. On top of that, our team of healthcare specialists are equipped with the latest breakthroughs in osteopathic science. At mhealth, we can put a stop to the unbearable pain in your neck, back, muscles, shoulders, spine, joints and lower back. Whether your pain is coming from sports injuries, whiplash, disc injuries, migraine, inflamed or blocked sinuses, or sciatic nerve compression, we are the ones to go to. Our osteopaths are able to relieve your pain without drugs or surgery, allowing you to once more enjoy a good night’s sleep, regain your vitality and be productive again. At mhealth, we don’t just treat the symptoms. We dig deep to the cause of your pain or discomfort and uproot it. Talk to our experienced team and get personalised information about your condition and treatment options.